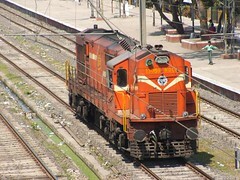 This image of a WDG3A from Pune rolling through Panvel station was my first railfanning photograph. Though I had attempted my hand in railfanning photography with a poor Handycam and a time-tested Kodak "film" camera, I got the best photographs on my Digicam. This was the first of them! I started loving WDG3As since then! The loco in this photograph is WDG3A #13059 from Pune. On most of my days, I spot a WDG3A (mostly from Pune!!!). I have started to develop a crush for these mini-monsters. I love seeing these locos on Express trains now-a-days. This is a scene that used to be an eye-sore for me until a few months back! Back to the history of this photograph! This image was the 260th image of the Digi-Cam which has now completed 7060 images. Over this period of about a year and 7 months, I have clicked over 1500 railfanning images. I was too scared to click that image. While recalling my mental position at the time of clicking this image, I tend to laugh uncontrollably! The day - 13 February 2005, at about 1215 - Myself, my Father and my brother walked into Panvel station in order to board the 6345 Netravati Express to go towards Trichur (in Kerala). We had brought the camera just about a week earlier. My brother brought a "waist bag" for me to carry the camera along. The camera has an SLR-like body and is too big to be kept in the pocket. I had tied the bag on my waist, and made an entrance into a very secluded station. I was feared of taking my camera out. My father was busy purchasing some reading material (newspaper, magazine, etc) from the only book stall at the station. I spotted this loco coming into Panvel station. I wanted to take an Image. We walked fast and walked up the Foot-over-Bridge. I asked my brother to keep an eye for RPF. He did that while I clicked the Image. I kept reviewing the image again and again while sitting on a Bench at the platform! At Panvel, Photography points are easier to find and it is easy to click images inspite of the presence of RPF station! So - This was the post for the day! Sorry for not being able to post tomorrow - My health did not allow posting. Thats it for the day. I will continue railfanning tomorrow onwards!